So what to do when you come home from 15 minutes of blackberry picking with a bushel of blackberries? Blackberry crumble of course. In the pan that you brought the blackberries home in because, the thought of cleaning another pan makes you want to crawl under your desk and hide. My friend Beth brought me the peach crumble version after I had James and I successfully ate the entire pan, though not in one sitting. It is perfect to keep in the fridge and dish out a bit each night. 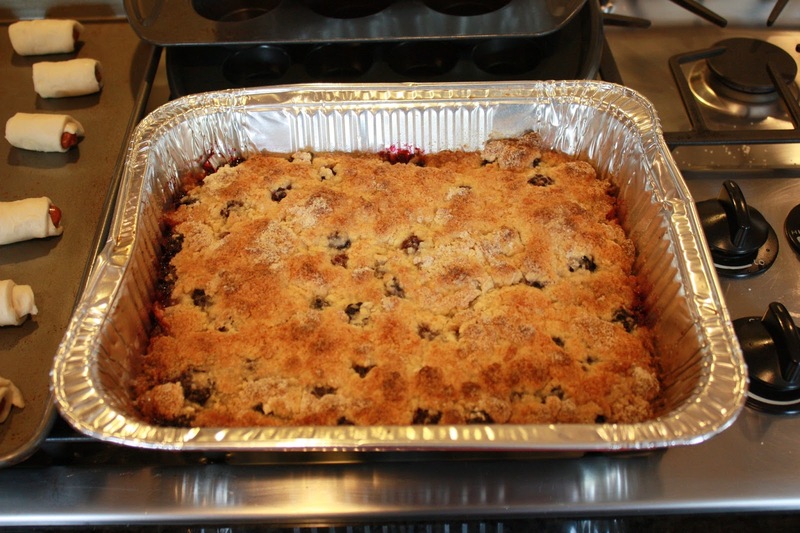 I dream about this crumble, I have made my fair share and this one is the best in my book. The perfect combo of fruit to topping. I don’t know what Alex thinks as I can’t be sure he has had any versions of this dish. I would ask him but then he would know he was missing out. Let’s just keep this our secret. And we know he won’t read it here – remember he “lives the blog” so doesn’t need to read it. The crumble is great with any fruit in season. Make it today with whatever is on sale. Then bring some to me because I have a two year old who can turn on the light in his room and does so at 5am. See you tomorrow morning. My only comment for the recipe is to be sure to use the 11×7 pan if you have it. You want this to be a thin layer of fruit and topping or it gets way too buttery. Alternatively, you could scale back the butter. But why? Just use a bigger pan. 1 Heat oven to 375*. 2 Put peach slices in greased, shallow 11×7 baking dish. 3 Mix brown sugar, flour, lemon juice, peel, and cinnamon. 4 Sprinkle over the peaches. 5 Mix flour, sugar, baking powder, salt, and nutmeg. 6 Stir in egg until mixture is coarse crumbs. 8 Drizzle butter evenly over topping. 9 Bake for 38 minutes.